Don't Miss: The Flaming Lips Static, distortion and an air raid siren. Now, that's my kind of music. 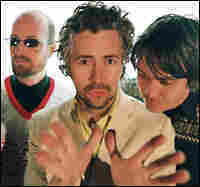 There is a special place in musical heaven for anyone who would name their band "The Flaming Lips." The name alone is the reason I remembered the alternative rock group from the early 90s. The band once appeared on Beverly Hills 90210 and that accounted for about six of its 15 minutes of fame. Now it looks like the group is about to get its other nine minutes. The Flaming Lips' new CD is called At War with the Mystics. It's an eclectic collection of songs featuring plenty of driving rhythms and pretty ballads. But the radio producer part of me is fascinated with the band's use of sound effects, including static, a weird sounding distortion and an air raid siren. Music journalist Ashley Kahn calls the Lips "a creative sound laboratory." (The group once released an album on four CDs with the idea that the disks should all be played at the same time). Check them out.